You might say Ken Libbrecht is into snowflakes. In fact, he’s made a career of studying them in his lab at Caltech. He’s even got a high-tech snowflake machine, which he uses to grow dazzling designer flakes of all shapes and sizes. 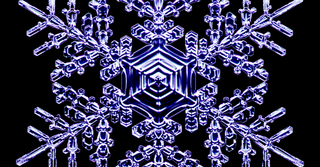 No two snowflakes are precisely alike, and Libbrecht is trying to figure out why. In order to do so, he watches the frosty crystals condense from water vapor onto a sapphire substrate, all the while taking high-res images with a digital camera rigged up to a microscope. Over the years, Libbrecht has amassed a brilliant photographic collection, not to mention the distinct honor of being the world’s first designer snowflake artist. Images courtesy of Ken Libbrecht. You can check out more of his work on his website, SnowCrystals.com.